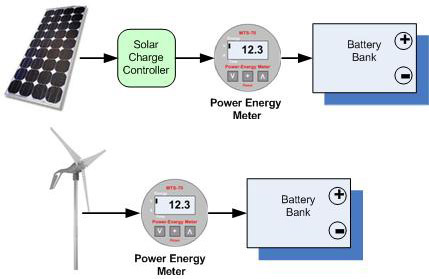 The Power Energy Meter (PEM) is a unique, 2 inch round, marine grade energy meter designed to monitor power and energy production of onboard renewable energy devices, such as solar panels and wind turbines. e Marine is pleased to offer the MTS-70, Marine industries first power-energy meter capable of monitoring energy produced by onboard systems such as wind turbines and solar panels. Exclusively developed to our specifications this meter monitors battery voltage, production current, and energy generated (can be set up in either amp-hours or kilowatt-hours). The MTS-70 retains historical information of the energy harvested for the previous three periods (can be set up to record either daily or weekly energy). As each time period is completed, the energy data is saved in non-volatile memory with the oldest being discarded as newer information is recorded. The down button "V" allows user to scroll between Voltage, Current, Elapsed Time and Energy. When displaying "Energy" the Up key allows scrolling through historical data. This is an excellent instrument to help in managing your onboard energy, plus assist in diagnosing potential system problems. The meter will operate on either 12 or 24 V DC systems and is sold as an independent meter (with either a 20/50/100/150A shunt). The MTS-70 comes completely calibrated with its shunt to measure current. It draws only 0.017 amps and is designed to be left on continuously, and has 5 levels of backlight (including OFF) that can be selected from the front panel and is saved to non-volatile memory. Mechanically it is 2.5" diameter front bezel by 4.1" deep (61mm x 104mm) and mounts into a: 2-1/8" (55mm) round hole. It can record up to 999 amp-hours or 999 kW. 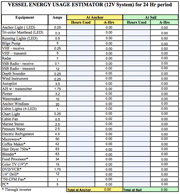 Includes: 25 feet of 18-2 shielded wire, fuse and 50 Amp shunt.